Nearly every MMORPG I have ever played suffers from one jarring, universal problem. It's particularly bad in brand-new games, or in brand-new content added to older games. I claw my way through a throng of other players who look just like me, to speak with an NPC. "I've never seen anything like you!" my quest-giver gushes. Really? Because I can spot fifty right now, with a brand new hundred by the time I get back to you to turn in my ten dead things. Being one of many facing cognitive dissonance in the panda throng is not new, unusual, or unexpected. 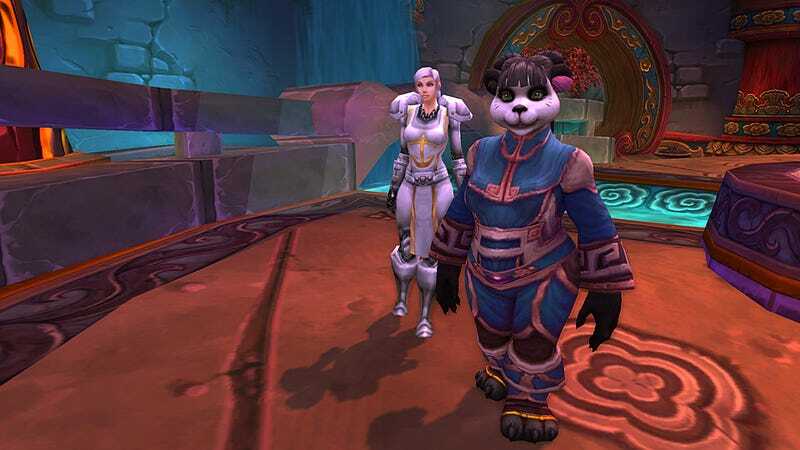 It is, however, the first in a series of many events that tell me Mists of Pandaria doesn't give two shakes of a panda's tail what an honest-to-god new player thinks of World of Warcraft. Actually, I lie. It's the second such event. The first happened before I even logged into the game, upon discovering that a Mists of Pandaria purchase doesn't include base game access, and is not valid to upgrade a trial World of Warcraft account. You need to get the base game (now sold in Battle Chest form with two expansions) first. I am that rare thing, an honest-to-goodness World of Warcraft newbie. I have played many MMOs, including WoW clones and competitors, but other than three weeks in 2006 and a very brief foray into the Pandaria beta, this is the first time I have ever actually sat down to play the dominant game of the genre. Six Years Ago, I Decided to Hate World of Warcraft. Can Mists of Pandaria Change My Mind? I kept battling this constant sense that the game actively expected me to have and know information that is not made particularly clear through normal gameplay. I am sad to report that, lovely music and lush landscapes aside, Mists of Pandaria doesn't particularly seem to offer anything new or special to entice the newbie player. Instead, I kept battling this constant sense that the game actively expected me to have and know information that is not made particularly clear through normal gameplay. It took the internet to tell me that I could get item comparison tooltips by holding down shift, and I discovered the dressing room function entirely by accident. And while figuring out what I needed to do after dying for the first time (gracelessly, in a turnip field) wasn't exactly rocket science, it certainly could have been made much more clear what my options were, and why. I also couldn't shake the feeling that, although the Wandering Isle where I started was a very carefully crafted experience, it was also, ultimately, an irrelevant one. Seeing hundreds of other players kitted out in exactly the same gear reminded me that individuality, at level ten, is of more or less no value—and neither are my quest rewards. Three vest upgrades in ten levels? Sure, I appreciated the armor, but hanging onto a reward for less than twenty minutes tells me that the reward is pointless. What I was pleased to discover, though, is a story. It's not my little rogue's story, but the Pandaren NPCs who accompany the newbie through levels 1-12, and join them in assimilating either to the Horde or the Alliance after, have a dramatic tale to tell. I think. After I arrived at Stormwind Keep and met the king there, my beary companion vanished. I am sure that her story resurfaces, because the king's words were too dark an omen for it not to, but as yet I've no idea how or when. I hope I don't have to wait for 70 levels for the next chapter. The panda soap opera, as it turns out, is something I can totally buy into. The quests around it, well, they're less distinctive. I need to kill 6, 8, 10, or 12 of something. Or rather, I need to gather said number of things from the corpses of stuff I killed, but naturally not every dead thing will drop a whatever. Eventually my journal says it's full and I go look for the marker on the map that says I should turn in my ill-gotten loot to someone who can use it. This is the way of the world. I mind more that I have to avoid and take turns with other players than I do that these are the quests we undertake. Still, WoW was ever thus. As I wandered the Wandering Isle, I felt mostly like I was visiting EPCOT. This was a variation on Chinese mythology that never quite was, an extraordinarily carefully built horseshoe-shaped tour of this custom-built island. The timing of the questing is exquisitely managed, like a theme park queue. I reached 50 quests completed at almost the exact moment I hit level 10, and reached the final stage of my tour at the same time. There, I met both the Horde and the Alliance and, working with representatives of both, wrapped up two more levels—and all of the starter area content—in quick succession. Having been guided so very carefully around a very limited starting area, I then found it pretty jarring to be dumped unceremoniously in "old-world" content with no clear idea of what direction would best continue my story. So now, as happens in large game worlds, I am a bit of a mercenary, performing tasks for any old exclamation point who lights up my path. Maybe eventually the game will show me how I can pick up a crafting profession, so that I can compulsively mine the nodes I find glittering so enchantingly in my path. And maybe, sometime after that, it will give me a reason for playing, other than "someday you will be level 80 and can earn rewards worth hanging on to." Kotaku's MMO reviews are a multi-part process. Rather than deliver day one reviews based on beta gameplay, we play the game for a few weeks before issuing our final verdict. Once a week, we deliver a log detailing when and how we played the game. We believe this gives readers a frame of reference for the final review. Since MMO titles support many different types of play, readers can compare our experiences to theirs to determine what the review means to them.